In my other life, I’m a speaker coach. I work for clients who want to speak in the TED style, and I also volunteer for TEDxSanDiego. This year I’m coaching three amazing speakers who could not be more different. And, unlike in previous years, two of them are local. Which means I get to go out to lunch. One works in San Diego’s Little Italy, so we met at Prep Kitchen restaurant. I started the meal with their watermelon gazpacho, which was topped with some kind of infused oil, shredded herbs, and toasted nuts. 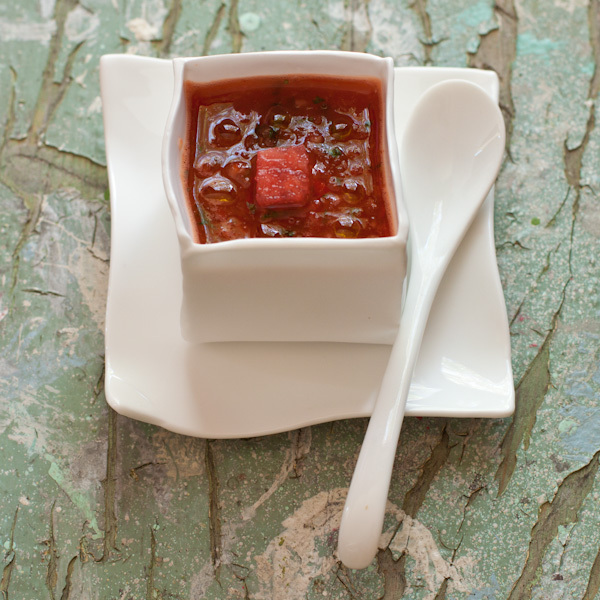 The dish was so light and refreshing, I decided to try my hand at making my own watermelon gazpacho. Traditional gazpacho is from the Andalusia region of southern Spain and is made with tomatoes, peppers, cucumbers, and sometimes zucchini. It’s thickened with dry bread. I made a gluten-free version a few years ago, based on a dish we had in Provence. 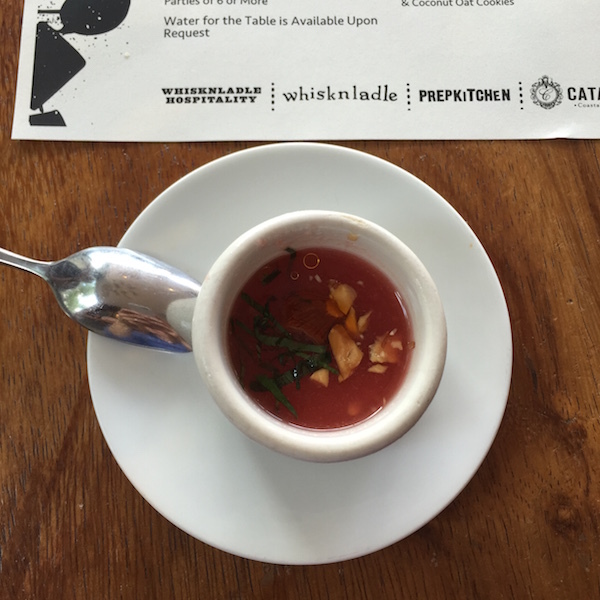 But I had never seen watermelon gazpacho. I looked at a few recipes (see below) for ideas. The restaurant’s version did not taste of tomato, had a little body, and was mostly a pretty, clear pink color. On my first pass, I made the mistake of using the blender and putting all the herbs in with the cucumber and watermelon. So it was back to the store to try again. This time, I used the food processor and added one roasted red bell pepper, blending the watermelon, cucumber, and bell pepper first until smooth. After pouring that out into a bowl, I used the food processor to finely chop the green herbs and stirred them in. Much better! I made basil-infused olive oil to drizzle on top, and added just a few tiny chunks of reserved watermelon. 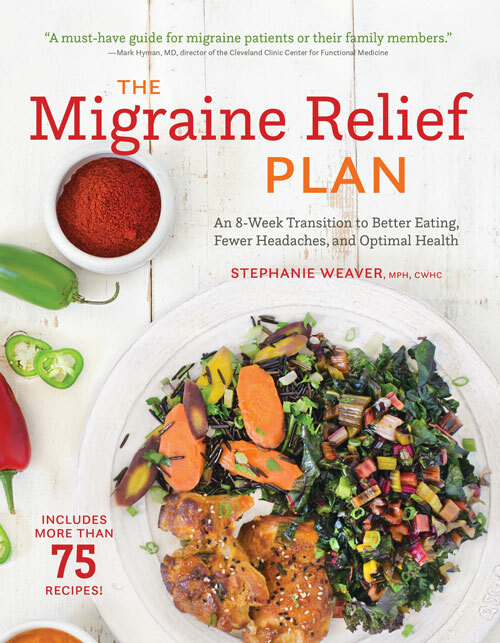 If you do not want to use nightshades, try adding one peeled zucchini for body in place of the red pepper. It would also be great as an appetizer or amuse bouche served as shooters. Purée cucumbers, watermelon, bell pepper, and green onion (if using) in the food processor until smooth. Remove to a medium bowl, using a spatula to get the food processor as clean as possible. Finely chop the parsley, mint, and cilantro (if using) in the food processor. Stir the chopped herbs and spices into the soup. If desired, add a small amount of sea salt and lime juice (if using). Refrigerate until very cold. 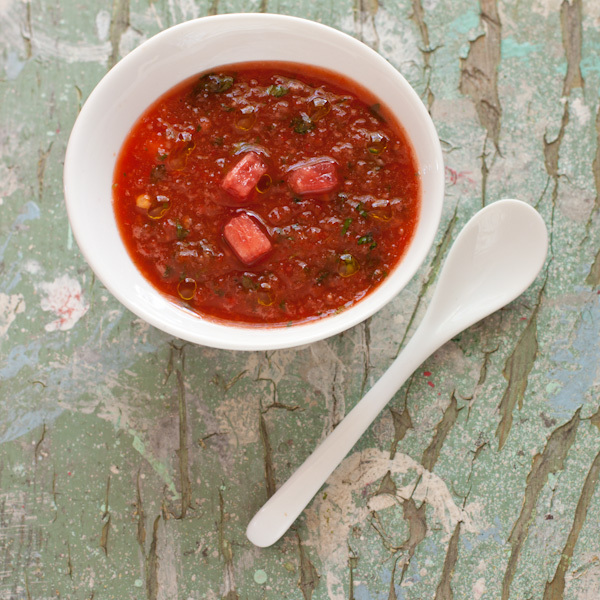 You can add some diced watermelon to give the soup more texture. Roll up the basil leaves and thinly slice (chiffonade). Stir into the oil in a small saucepan. Heat over low heat for 10 minutes. Turn off heat and let sit at least 20 minutes or until cool. Strain into a clean glass jar. Use a spoon or eye dropper to drizzle oil over soup when served. Yum! trying this. I love gazpacho, and I love watermelon. Cold soups in general are such wonderful things in the summer time. Thanks for the recipe. Thanks Anita! Let me know if you try it, and yes to cold soup!